Ellipsoidal particle levitating at the optical beam waist, with its long axis aligned to the beam axis. © B. M. Mihiretie et al. A new study of how particles may respond to the mechanical effects of light helps improve optical manipulation and remote sensing of non-spherical particles. Manipulation of small objects by light has gained in popularity in the past few years. Now, scientists have performed the first systematic analysis of the behaviour of ellipsoidal particles manipulated by laser beams. The work shows that such particles are constantly moving in and out of the reach of an optical beam, creating oscillations. These findings by a team of researchers from the University of Bordeaux, France, have just been published in EPJ E. This work could help understand the unusual behaviour of rod-like particles manipulated by optical tweezers. Ultimately, the theoretical part of this work could contribute numerical models of how complicated shapes and large sizes scatter laser light. Numerous applications exist in fluid engineering and remote sensing methods. After five years of impeccable service as Editor-in-Chief of the soft matter part, EPJ E must say thank you and goodbye to Professor Daan Frenkel, as part of the journal’s process of continuous renewal. 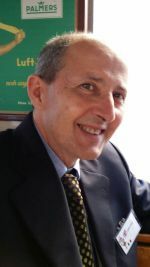 We are delighted to announce the arrival of his successor as of January 1st 2015: Professor Francesco Sciortino of the University of Rome La Sapienza. Sciortino started his scientific career with an experimental PhD on the phase behavior of biopolymers solutions at the University of Palermo, and shortly after moved on to numerical simulation methods in which he has become a renowned expert. He has held various appointments through the years in Boston, Cagliari, Bordeaux, Western Ontario, and Paris. His research interests are varied and include: self-assembly in colloidal systems and protein solutions, bio-functionalized colloids, aggregation phenomena in colloidal systems, cluster phases and gels, thermodynamics of anomalous liquids, thermodynamics of supercooled liquids and their glass transition, percolation and phase transitions in complex liquids. 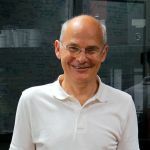 We wish Francesco Sciortino great success as EPJE EiC, in connecting the journal with the soft matter community to EPJE. Daan Frenkel will continue to sit on the journal Advisory Board. 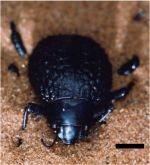 A preserved specimen of the Tenebrionind beetle (Physasterna cribripes) was used for this study, displaying the insect’s mechanisms of dew harvesting. © J.M. Guadarrama-Cetina et al. Insects are full of marvels—and this is certainly the case with a beetle from the Tenebrionind family, found in the extreme conditions of the Namib desert. Now, a team of scientists has demonstrated that such insects can collect dew on their backs—and not just fog as previously thought. This is made possible by the wax nanostructure on the surface of the beetle’s elytra. These findings by José Guadarrama-Cetina, then working at ESPCI ParisTech, France—on leave from the University of Navarra, in Spain—and colleagues were recently published in EPJ E. They bring us a step closer to harvesting dew to make drinking water from the humidity in the air. This, the team hopes, can be done by improving the water yield of man-made dew condensers that mimick the nanostructure on the beetle’s back. Biological membranes are mainly composed of lipid bilayers. Gaining a better understanding of adsorption of solution ions onto lipid membranes helps clarify functional processes in biological cells. Now, a new study provides a quantitative description of the equilibria between lipid membranes and surrounding solution ions. Joanna Kotyńska and Zbigniew Figaszewski from the University of Bialystok, Poland, are the authors of a study describing these findings, just published in EPJ E. In addition to shedding some light on biological processes, these results could also have implications for, among other things, the future development of medical diagnostics. Flow pattern 2 min after the start of vibrations. © Y. Gaponenko et al. Thermodiffusion, also called the Soret effect, is a mechanism by which an imposed temperature difference establishes a concentration difference within a mixture. Two studies by Belgian scientists from the Free University of Brussels, recently published in EPJ E, provide a better understanding of such effects. They build on recent experimental results from the IVIDIL—Influence Vibration on Diffusion in Liquids—research project performed on the International Space Station under microgravity to avoid motion in the liquids. Streamlines, velocity field, and magnitude of the share of the propelling flow attributed to the low level inertial force, in the case of touching spheres. © Nadal et al. Scale plays a major role in locomotion. Swimming microorganisms, such as bacteria and spermatozoa, are subjected to relatively small inertial forces compared to the viscous forces exerted by the surrounding fluid. Such low-level inertia makes self-propulsion a major challenge. 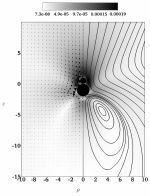 Now, scientists have found that the direction of propulsion made possible by such inertia is opposite to that induced by a viscoelastic fluid. These findings have been published in EPJ E by François Nadal from the Alternative Energies and Atomic Energy Commission (CEA), in Le Barp, France, and colleagues. This study could help optimise the design of self-propelled micro- and nanoscale artificial swimming machines to improve their mobility in medical applications. Models for the evolution of life are now being developed to try and clarify the long-term dynamics of an evolving system of species. Specifically, a recent model proposed by Petri Kärenlampi from the University of Eastern Finland in Joensuu accounts for species interactions with various degrees of symmetry, connectivity, and species abundance. This is an improvement on previous, simpler models, which apply random fitness levels to species. The findings published in EPJ E demonstrate that the resulting replicator ecosystems do not appear to be a self-organised critical model, unlike the so-called Bak-Sneppen model; a reference in the field. The reasons for this discrepancy are not yet known. The journal EPJE – Soft Matter and Biological Physics is pleased to honour Ludwik Leibler with the 2014 EPJE Pierre-Gilles De Gennes Lecture prize. Leibler is researcher at CNRS and Adjunct Professor at ESPCI ParisTech where he directs the Laboratory for Soft Matter and Chemistry. The Editors of the journal nominated him for his seminal contributions to polymer physics and the revolutionary polymeric materials, self-healing elastomers and vitrimers that he invented. This is the 4th edition of this prestigious prize, named after the Nobel laureate who founded EPJE. The prize consist of 1000 Euros and a plenary lecture that will be introduced by Daan Frenkel, co-Editor-in-Chief of EPJE. The EPJE Pierre-Gilles de Gennes lecture will be delivered July 22nd in Lisbon, during the 9th Liquid Matter conference of the European Physical Society. Forces acting on glass particles in a magnetic field. © Liu et al. 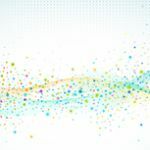 Separating particles from the liquid they are in can now be done with a new concept, based on horizontal deflection during particle levitation for the separation of minerals and particles. Magnetic separators exploit the difference in magnetic properties between minerals, for example when separating magnetite from quartz. But this exercise becomes considerably more complex when the particles are not magnetic. In the wake of previous particle levitation experiments under high-power magnetic fields, a new study reveals that particles are deflected away from the magnet’s round-shaped bore centre in a horizontal direction. Previous studies had observed the vertical levitation of the particles. These findings are presented by Shixiao Liu from the Faculty of Engineering, University of Nottingham, UK and colleagues, in a paper recently published in EPJ E, and could led to a new concept in particles and minerals separation technologies. Friction-dominated growth. © Blanch-Mercader et al. A new study investigates the role of cells’ alignment in shaping biological tissue, as cell division provides dynamic evolution during tissue growth. A team of European scientists has now extended a previous biophysical model to investigate elongated growth within biological tissues to describing the evolution over time of the shape of a fruit fly’s wing. They found the aspect ratio of the typical biological shapes may exhibit a maximum at finite time and then decrease. For sufficiently large tissues, the shape is expected to approach that of a disk or sphere. These findings have been reported by Carles Blanch-Mercader from the University of Barcelona, Spain, and colleagues, in a paper published in EPJ E. They provide a more general classification than previously available of the different types of morphologies a tissue can be expected to attain, depending on its initial size and its physical properties.